Visit the global Endangered species archives for posts from all DGR sites. 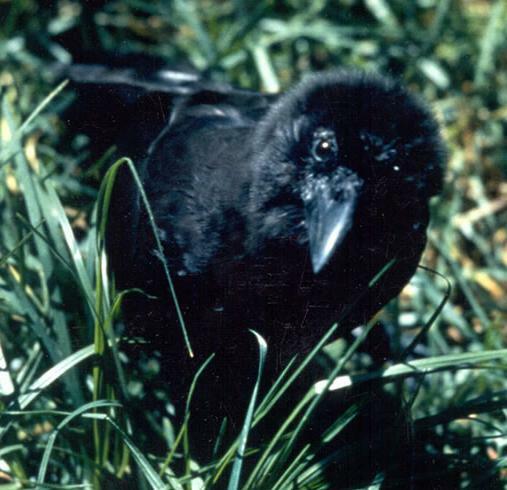 The ‘Alala, or Hawaiian crow, is on the verge of extinction, with the last sighting in the wild in 2002. A captive breeding program has been underway for decades, but the last attempted release in the 1990s was unsuccessful. The program will be trying releases again over the next five years, hoping for more success by releasing the birds into fenced areas. Deep Green Resistance works for land restoration and protection. We’re very excited about the possibility of bringing these bird backs to the wild, where once again they can fulfill their traditional responsibilities to the rest of their community as seed dispersers and omnivorous foragers. Wherever you live, many species are in peril…but there are also efforts to protect them. We urge you to get involved however you can. Read more about the planned introductions. This entry was posted in Listening to the Land and tagged Big Island, Birds, Endangered species on March 26, 2016 by Norris Thomlinson.